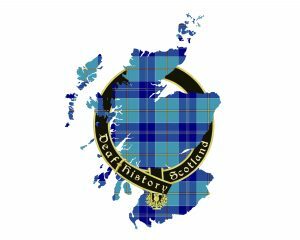 Deaf History Scotland’s Scottish Deaf History tartan was launched at the AGM 2018 / 10th Anniversary Celebrations! The tartan, designed by Silvia Maria Cera when a textiles student at Heriot-Watt University, was created to celebrate the passing of the British Sign Language (Scotland) Act in 2015. Silvia based her design on the colours of the Sign Union Flag, designed by French Deafblind artist Arnaud Balard. She added Saltire white to give this international emblem a Scottish twist! Silvia assigned the tartan design to Deaf History Scotland to help raise awareness of the value of Deaf heritage and to fund our projects with and for the Deaf community. Welcome to Deaf History Scotland’s archive room! It’s small now because we only started the archive one year ago, but we are gradually building it up. I want to share some really wonderful news with you. A special tartan has been created called the Scottish Deaf History tartan. If you look at the colours, you might recognise them from back in 2013 when a French Deaf man called Arnaud Balard designed a flag called the Sign Union flag. So how was the tartan designed? The designer was a hearing student from Heriot-Watt University in Edinburgh who was a student of textiles and fabric design. She decided to create a tartan using the same colours as the flag. 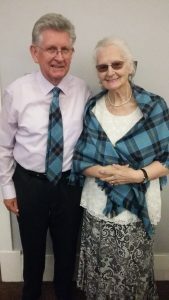 Her name is Silvia Marinas Cera, and she offered the design to us at Deaf History Scotland to officially register as the Scottish Deaf History tartan. The tartan was designed back in 2015, in the same year that we celebrated the British Sign Language (Scotland) Act becoming law. If anyone would be interested in buying some tartan merchandise, look at our website from October 2018. But for now, everyone on the Deaf History Scotland committee would like to say that we wish that we could be with you at the Deaf History International conference in Sydney but we wish you all well! Hello, my name is Arnaud Balard. I come from France, I am Deafblind (I lost my sight actually). I am artist, designer, writer, and lecturer, among others. You see, behind me, the flag of the union of the signing people, it’s name in sign language summarizes it (Arnaud makes the sign of the flag in LSF). Scotland has created a wonderful tartan, and I thank them. The 3 colors, and it’s really a beautiful symbol of an identity that shows the sign language in the world. Thank you. Why is it a beautiful symbol? Because the unity makes it possible to move forward all together !!! Deaf, Deafblind, Ushers, hearing, Codas … All together, in fraternity, yes it’s beautiful. Thanks to the Scottish people, and thanks to everyone! Good bye. 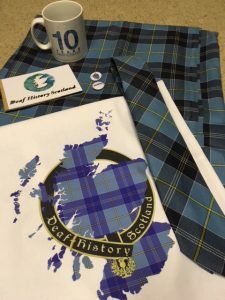 We will soon have merchandise available in the Scottish Deaf History Tartan, all proceeds of which will support our Archive project! Watch this space!